If Apple’s latest iPhone is any indication, wired headphones may soon be a thing of the past. On the plus side, there are already plenty of wireless options that can help you make a smooth transition. We’re taking a closer look at two wireless headphones from Beats by Dr. Dre: the Powerbeats2 Wireless and its successor, the Powerbeats3 Wireless. 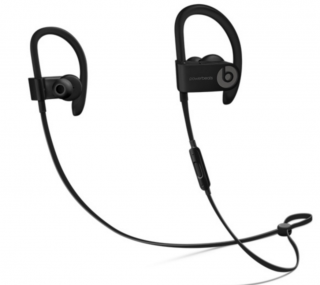 The Powerbeats3 Wireless has a battery life of up to 12 hours, which is double that of the Powerbeats2 Wireless. Other than that, there aren’t many noticeable differences between the two. Beats says it has made some minor adjustments from the Powerbeats2 to the Powerbeats3, like implementing an “improved ergonomic design,” but the two are virtually identical. Both connect to your smartphone, laptop or other device using a Bluetooth signal rather than a 3.5mm jack. Although they’re labeled as “wireless,” the headphones aren’t completely untethered. They have a cable that drapes across the back of your neck and connects the earpieces together. Located on this cable are three RemoteTalk buttons, which you can use to skip songs and answer phone calls. There’s also a clip on the cable that lets you adjust the length and keep the headphones snug. Each earpiece consists of an earbud and a flexible hook that fits over the top of your ear to keep them in place. The Powerbeats3 and Powerbeats2 come with different-sized eartips — the pieces that cover the earbuds — to choose from. Both headphones are sold in a variety of colors. Sweat and water resistance. The Powerbeats3 and Powerbeats2 can withstand exposure to moisture, so you can wear them in the rain or while working out. Built-in microphone. Press the buttons on the cable’s RemoteTalk control to make or answer phone calls. Quick pairing. The headphones are designed to easily connect to your Bluetooth device. Just hold the RemoteTalk button down when you’re near your device to sync. Battery indicator lights. Each has LED lights on the earpiece that let you know when you’re running low on battery. USB charging. Recharge your headphones through the micro-USB port, also located on the earpiece. Carrying case. The Powerbeats3 and Powerbeats2 come with cases to keep them protected when they’re not in use. Apple W1 chip. Apple purchased Beats in 2014, so it’s not surprising to find some crossover technology. The Powerbeats3 contains Apple’s W1 chip — the same chip found in Apple’s new wireless AirPods — which improves the performance and extends the battery life. Let’s learn more about the battery. The main distinction between the Powerbeats3 and Powerbeats2 is the battery life. The Powerbeats2 tops out at six hours of play. Because the Powerbeats3 houses the W1 chip, it can last up to 12 hours on a full charge. Both models can recharge quickly; however, the Powerbeats3 charges faster. It offers up to an hour of play after charging for just five minutes, whereas the Powerbeats2 needs 15 minutes of charging to do the same. These wireless headphones share a retail price of $199.95, but because Beats has discontinued the Powerbeats2, you can find it at a discount at several third-party retailers like Amazon. 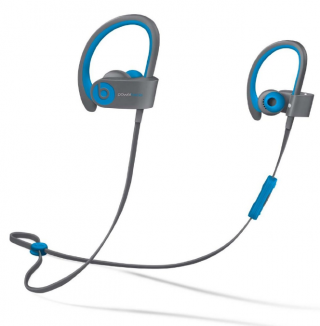 The Powerbeats3 and other Beats products are available at Apple. The Powerbeats3 Wireless and Powerbeats2 Wireless are both convenient for exercising. There are no cords to interfere with your movement, and they can last for several hours between charges. If you already own the Powerbeats2 and find the battery life to be too short, or if your workouts are especially lengthy, it might be worth upgrading to the Powerbeats3, which lasts twice as long and recharges rapidly when you’re in a pinch. Otherwise, we recommend you go with the Powerbeats2. It gives you practically all of the same features as the Powerbeats3, still charges quickly, and you should be able to get it at a sale price. Lauren Schwahn is a staff writer at NerdWallet, a personal finance website. Email: lschwahn@nerdwallet.com. Twitter: @lauren_schwahn.